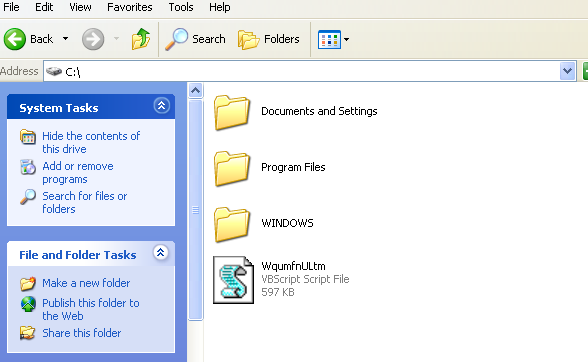 If you have succeed to exploit a system you may consider to place a back-door in order to connect again easily with your target.For example if the user decides to install a patch or to remove the vulnerable service in his system then you will need to figure out an alternative way for getting again access to the remote system.That’s why back-doors are important because they can maintain access to a system that you have compromised. 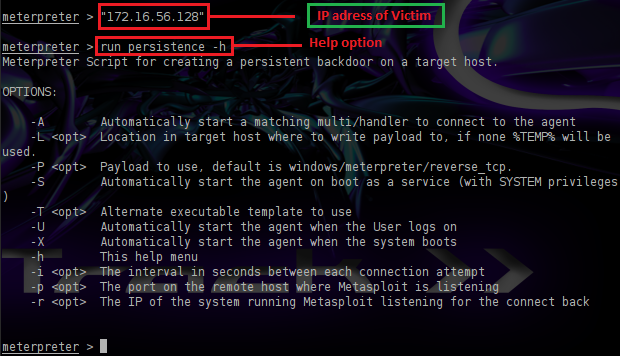 The Metasploit Framework comes with two options for backdooring a system. In this article we will look at the persistent backdoor of Metasploit Framework which is actually a meterpreter script that can create a service on the remote system that it will be available to you when the system is booting the operating system. Lets say that we have already compromised the target by using a meterpreter reverse TCP connection and we need to place the persistent backdoor. First we can execute the command run persistence -h in order to see the available options that we have for the backdoor. As we can see there are different options for the persistent backdoor.The help file is very clear so we will only explain the options that we will choose. The -A parameter will automatically start the multi handler.Another option is the -L which allows us to specify the location on the target host that the payload will be.For our scenario we have chosen the C:\\ as the path in order to find the backdoor easily.The -X option is because we want to start the backdoor when the system boots.Alternatively there is the -U option.For the interval option we have set it to 10 sec and for the port that the backdoor will listen the 443 which in most windows environments is open.Finally the -r option is for our IP address. You can see in the next image the process of the persistence backdoor and the options that we have select. As we can see we have opened a new Meterpreter session on the remote machine.On our target host we can see that the script has transferred on the C: drive. The next image is showing the second meterpreter session that it has opened which means that the backdoor is working. Now its time to check if the backdoor will open for us a new session every time that the system will boot.So we will reboot the system in order to see what happens (see the next two images). After the reboot we will execute the command sessions -i in order to check if the backdoor have connected with our system. We can see that the backdoor is working perfectly.So we can use the sessions -i 3 command in order to interact again with our target and to execute commands.For example we can use the getuid and the ipconfig commands in order to discover the IP address and the name of the user that is running the operating system. Finally in penetration testings we always clean up after the engagement.So if you want to remove the backdoor from the target you should execute the command resource and the path of the resource file that has been created.You can see the first image in this article in order to see the path of the resource file. The image above is showing that the command resource has successfully deleted the backdoor.The reason that we have an error in the PID of the process is because the PID of the process has changed when we rebooted the target.The operating system gave another PID in our process but there is nothing to worry because with the next reboot the backdoor will not run anymore. The problem with the persistent backdoor is that doesn’t require any authentication so anybody that can gain access to port 443 (which is the port that the backdoor is running) can connect to our target host.So always remember to clean up the processes and the backdoor on the remote systems after that the penetration testing is completed.The last thing you want as a penetration tester is to put your client systems at high risk.